the bass that makes you want to move your feet! My daughter said that to me, many years ago. It was her answer when I asked her why she wanted to play the bass guitar like her dad. And you know what? She’s right! The bass is the foundation of the band. Sure, the drummer’s got to have a great groove, and you need to know how to work well with your rhythm partner. But it’s the bass that ties the rhythm to the melody and the harmony. It’s the bass player that makes everyone else sound better – or worse! If you burn to learn bass guitar, you’ve come to a great place to start your journey. Here I’ll show you the basics, help you with gear advice, and career advice, and offer my recommendations of the best course material available for you to study. I’ve also invited some of my closest friends to help you, too. 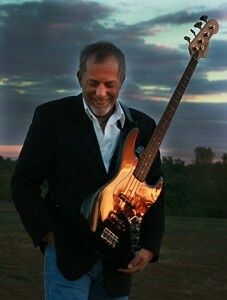 In addition to my own lessons,you’ll also get to learn from other exceptional players who have risen to the top of the field, including Roy Vogt of Teach Me Bass Guitar fame, Sean O’Bryan Smith – a highly successful player, composer, producer and writer, and Joe Sanchez, composer, educator, and freelance bassist extraordinaire. Getting Started – basic information about the bass guitar, and how to practice. If you’re brand new to the instrument, or to an organized learning program, these lessons are a great place to start. Scales – Like the sign says, this is all about scales. Not just the basics, mind you. I’ve also included several exercises to help you vary the way you practice your scales to improve your rhythm and to learn how to combine the notes in numerous ways. Beginner – These exercises begin with very basic lessons to get you used to having your hands on the bass. From there, you’ll progress through basic scales and riffs, and learn a little music theory along the way. While it may not appear to be so in the beginning, an understanding of music theory will help you progress much more quickly. Intermediate – Once you’ve got the basics under your belt … er… fingers, I’ll introduce you to more advanced scales and riffs. You’ll also learn how to build your own bass lines using more advanced music theory. Blues – It’s true that I’ve played everything but Rap and Opera, but much of my career has been spent playing the Blues, as well as its “children” Soul, R&B and Rock. I’ve spent decades learning the nuances of Blues bass, and will teach you what you need to know to take your place in any Blues band. I’ll also show you how these lines translate into other styles of music. Gear – Of course, being a skilled player is the most important part of playing bass guitar. But you also are going to need good equipment. This section will offer information to help you make an informed decision. I also show you the gear I use, and why. Music Business – We may play music, but we have to work the business if we want to succeed – whether as a local player or a top touring pro. In this section we’ll look at several facets of the music business to help you navigate the shark-filled waters. As the site grows, I will further subdivide the lesson material, and may also add new categories. Remember, though, that this is your site, too. I want to hear from you! I want to know what else you feel you need to be the best bass player you can be. I really admire your mastery of the Bass; it’s a constant source of inspiration for me as a student. When I first came to you, I was frustrated and lacked any sense of direction . Now, three months later, it’s like night and day! I have a source of inspiration (you), I have a sense of direction. I practice everyday and longer, and I’m playing with confidence. ~ Chris T.
The View From Here is Thunder Row’s Album of the Year for 2014. Musical Ambassador for Washington, DC since 1988. Dig the Hole, Lane’s 2008 CD with Deeper Blues received rave reviews and continues to be hailed as some of the best Blues of the past several decades. Iconic Blues bassist Johnny B. Gayden (w/Albert Collins for 15+ years) calls Lane one of the best bassists on the scene today, and a gifted songwriter and storyteller. Co-founder of Low Notes for Nashville, an international group of top artists providing relief to musicians devastated by the May, 2010 flood. Extensive touring background as both a solo artist and sideman performing for millions internationally during a career spanning over thirty years. Has presented numerous clinics and workshops in the US, including at prestigious Belmont University. Sam Ash calls Lane one of the best presenters they’ve ever hosted. As a bassist, Lane Baldwin (know for decades as Lane on Bass), is so focused on his main goal that he made it his motto: rock solid & pocket wise. His career has spanned forty years and six continents, touring and recording with some of the best Blues musicians in the country. Lane is far more than a bassist, however. He’s also an award-winning singer, songwriter, music educator, author and social activist. He’s also a pretty good cook. For more than a decade, he fronted Deeper Blues, which legendary Blues bassist Johnny B. Gayden (Albert Collins) called “perfectly named”. The band’s 2008 CD, Dig the Hole, rapidly gained international attention, and continues to be called one of the best Blues CDs in decades. Lane’s bass work has been described as elegant yet powerful, a style that Grammy-nominated producer Peter Bonta calls “deceptively simple.” A master of understatement, Lane’s solos are lyrical without flash for flash’s sake, a credit to his years of classical and Blues training. Then again, he’ll totally tear it up when the time is right. A strong believer in giving back, Lane has combined his music with his social activity in many ways. When disaster struck Nashville in May, 2010, Lane joined with close friend Sean O’Bryan Smith to found Low Notes For Nashville, an international community of top bassists and other artists, to serve musicians devastated by the flood. The group has raised tens of thousands of dollars to assist those in need, and will soon release a live CD and DVD of the Low Notes Benefit Concert, held in July, 2010. In addition to performing, Lane MCed the entire event. For more on Lane and his activities, visit the Lane Baldwin web site.